This is a sample of biochar produced from coarse woody biomass. Biochar is a pure carbon product made from organic material that is generally produced through a process called pyrolysis. Pyrolysis is the decomposition of organic matter at elevated temperatures in an environment with limited oxygen. 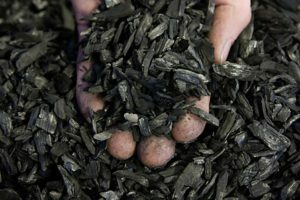 Biochar can be produced using woody biomass such as wood chips, sawdust, shavings or bark that is generated from timber harvesting or as a by-product of wood products manufacturing. 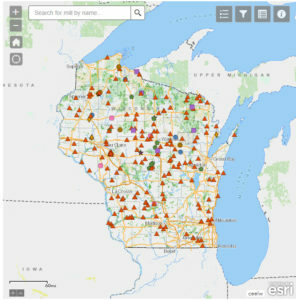 The Forest Products Services program recently worked with the Technology Services Section in the Division of Forestry to develop an interactive mapping tool highlighting Wisconsin’s primary wood-using mills. The new mill mapping tool highlights Wisconsin’s primary mills. The goal of the mapping tool is to facilitate better marketing of forest products by connecting value-added industries with Wisconsin’s primary mills and by assisting forest managers and loggers with identifying markets for harvested timber. Mill data can be refined by county, species processed, products utilized, and products sold and then downloaded for later reference. Wisconsin’s primary forest products industry consists of firms that manufacture logs and pulpwood into wood and paper products. Specific examples include sawmills, veneer plants, pulp mills and firewood processors, as well as companies that manufacture products such as composite panels (e.g. oriented strand board, particleboard), shavings, utility poles, wood pellets, and log buildings. Mill data featured in this tool is collected by Forest Products Services staff as part of the USDA Timber Product Output survey. The FPS program will refine this dataset beginning in early 2019. It should be noted that a subset of mills opted-out of the mill dataset. Therefore, you may be aware of additional mills that are not included in the mapping tool. If you know of a business that would like to be included in this mapping tool, please send an email to a staff member on the Forest Products Services team and include their contact information, species and products utilized, and products produced. Many communities have expressed greater interest in local goods and services over the last few years; as a result, urban wood recycling efforts have increased in Wisconsin. The increase of trees killed by invasive insects and disease caused many municipalities to seek alternative uses for urban wood rather than disposing material in a landfill. Recent efforts to market this growing source of material and develop ways to recycle urban trees within communities led Wisconsin to become one of the leading states in urban wood utilization. Live edge walnut slab table at a Milwaukee based business. Throughout the state, markets have started to grow; at least 30 companies are producing products made from urban wood. The City of Milwaukee cut their disposal costs in half by sending their street tree removals to Kettle Moraine Hardwoods and Bay View Lumber. Consumers are drawn to urban wood for its unique character appearance that enhances its use in furniture, cabinets, flooring, millwork, wall and ceiling panels. Urban wood can now be found in large scale projects such as ceiling and wall panels at the new Milwaukee Bucks Arena, and apartment and business buildings in Milwaukee. In both Milwaukee and Madison, the hobbyist wood worker can find urban wood lumber and live edge slabs at the local Habitat for Humanity Restore. 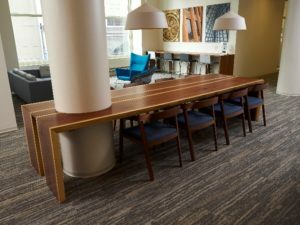 Urban wood manufacturers have noted an increase in demand for live edge slabs for use in tables, desks and countertops. Demand for urban wood has increased not only in Milwaukee and Madison, but across the state in other communities such as Green Bay, Appleton, and Eau Claire. In Eau Claire, urban wood is making some noise (literally) after repurposing in the manufacture of guitars. In addition, the City of Eau Claire has partnered with some Wisconsin Urban Wood members to produce furniture and specialty products. Wisconsin Urban Wood is the brand that assures consumers that the wood originated from Wisconsin’s community forests and passed through an entire supply of Wisconsin-based business to arrive as the final product. However, a need still exists to help end-consumers and other users, such architects, interior designers, and engineers, understand the benefits and value of using wood and overcome perceived barriers. Wood is a renewable resource as opposed to substitute non-renewable products such as concrete, steel, and plastics. For more information on urban wood use or to find an urban wood user in your area please visit Wisconsin Urban Wood or the Urban Wood Network. The Wisconsin Department of Natural Resources -Division of Forestry is conducting a survey on Wisconsin’s secondary wood manufacturing sector. This sector includes Wisconsin firms that purchase and produce products from lumber, blocks, wood components, fiberboard, plywood, veneer, and manufacturing residue.